Railway Preservation News • View topic - Help with identifying a number board - PRR I-1s or E44? Help with identifying a number board - PRR I-1s or E44? Post subject: Help with identifying a number board - PRR I-1s or E44? For those who did not know of him, we lost a legendary PRR fan and a founding father and the patriarch of the locomotive horn collecting hobby this past February 1st. Ed Kaspriske was a fixture and a legend in the railfan community in Pennsylvania. He was a prolific photographer and videographer. 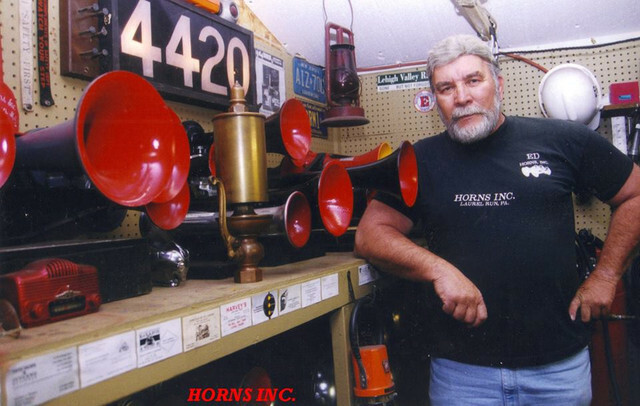 His work is immortalized online, and his memory will live forever in the bi-annual locomotive horn exhibitions that are held at the World Famous Horseshoe Curve in Altoona, PA which are now named in his honor. I was fortunate to be given the chance to save some of the PRR relics he had collected, as well as his remaining horn collection, just before he passed. Some of these items will be donated to the Railroader's Memorial Museum in Altoona in his memory. Other items will become part of a permanent display during the horn collector gatherings at the Horseshoe Curve. One of those things is a number board that occupied a place of honor in his locomotive horn shop. It was perpetually backlit and actually framed into the wall. Anyone who knew Ed's work, knew that number board. Henceforth, it'll be on display in Altoona at our horn exhibitions. In all the years I knew Ed, I don't ever remember asking him about its heritage and I don't remember him volunteering the story. I think I've narrowed it down, but I'm hoping to get some confirmation for historical accuracy. At first I thought it was from Conrail (nee-PRR) E-44 electric #4420. In trying to find it in photos, I noticed that it was too small and not shaped like those on the E-44s. Further investigation based on what I knew about Ed led to only one other possibility: Could this be one of the 2 number boards from either side of the headlight of BLW / PRR 4420 - an I-1SA 2-10-0 Decapod? It measures 23 1/2" by 10". Attached are 2 photos. If anyone has any insight into this or information on the size of the number boards on PRR I-1SA Decapods, I sure would appreciate it. Post subject: Re: Help with identifying a number board - PRR I-1s or E44? Size of the glass and style of the lettering tells me it is not from an I1sa Decapod. I would lean towards an electric or Diesel Electric locomotive. Second the motion. E44 or something non-PRR. Quick Google look at the E44 at RRMPa shows the number boards extended all the way from outer edge of hoods to headlight enclosure, so the noted size definitely looks like it was from the electric. PRR steam headlight cases weren't that much different in size from P-N or ESSCo can-type cases, so it would be way too big for steam. Just a stab in the dark, I'm no expert on American equipment. I do not believe that is from an E44. If you look at the loco in the RMPA, the font is slightly different than what is shown. There is a black line going through the numbers. I do not know if this is original or if this was done during its restoration. On the other hand, I believe this is too large for an I1s numberboard. If you go to the RMPA, also look at one of freight locos such as 520, the numberboards are small so that they fit into the headlight housing. It could possibly be from the SO GS class, but I am not sure. I'm actually starting to lean back towards the E-44 theory. I dismissed it at first because of the shape. Photos of the E-44s seem to suggest a number board with rounded corners, held in to the sheet metal opening of the light box with the typical H-profile gasket used on most EMD and GE diesels (I once made and installed a number board for the nose of an E-8A, so I know that gasket well and what a royal pain it is to install!) However, my number board has sharp corners, and thanks to one close up photo of PRR 4465 at the RRMPA, it appears that the glass does not have rounded corners and is mounted from inside the light box. Only the opening in the sheet metal has rounded corners. There are no good photos of 4420 online that show details of all 4 boards, but this photo of 4429, after the Conrail paint shops finally had a chance to work on her, seems to match the font and style rather closely. I guess the only true confirmation would be to actually put a tape measure on 4465 in Strasburg. It's way too big to be in the headlight. I have a number board from Pennsylvania P5A electric locomotive which has a similar headlight. It only measures 11" long by 5 1/2" tall. The letters are from stamped metal with white glass behind it. The F unit number boards are square. It looks like a Penn Central style to me. Penn Central always seemed to have numbers that looked like the were hand made. I would say it is most likely the E-44. I do believe I have a Conrail E-44 number board in my collection. I will see if I can find it and measure it. Sir, if you do have an E44 number board, I would be eternally grateful if you'd find it and measure it for me. That would save me the 150 mile drive to Strasburg and would certainly beat trying to explain to the museum staff why I'm climbing on their E44 with a tape measure. I will see if I can find it and get back to you.